9. Provision of water supply and sanitation services and their development in the region have mirrored the dramatic political and economic changes in the region since 1990, during which the region has moved from a centrally planned, state-run, socialist economy to a western-style democratic, capitalist system and EU membership. The largest part of the Danube catchment area belongs geopolitically to South-East Europe, and in general has shared the same destiny over the last 50 years. Countries that are the subject of this report, from the Czech Republic to Albania (with a partial exemption of post-Yugoslavia countries), have during the second half of 20th century belonged to the so-called socialist block of European countries, and their economic and political situation and development, regardless of major differences among them, has broadly followed a similar path. Development of and issues in water and sanitation services provision in those countries, being part of overall municipal service provision, have also followed a broadly similar process of transformation that can therefore be viewed as a region-wide development process. 10. During the last 25 years, the sector’s development and changes were driven by two major political and economic processes. The first one was the fall of communism and disintegration of the Eastern European socialist block in 1990, which led to change in the political and economic system in those countries. The second was the expansion of the EU toward Eastern Europe, bringing gradual alignment with the EU acquis communautaire in candidate and new member countries. Both of those processes have also seriously impacted water service provision and environmental standards in the region, leading to changes in service standards, financing, and governance. While the current sector organization is described in detail in Chapter III, the following provides a brief historical synthesis of the main stages of public service delivery in the region in the recent past. Socialist system period (until 1990). This period was characterized by rapid industrialization, a lack of environmental sensitivity, and strong urbanization. The necessarily rapid development of the water supply infrastructure was not followed by adequate wastewater and wastewater treatment provision, causing major deterioration of natural water quality in receiving waters. Property, service provision, and management of utility providers was mostly in the hands of the central government (with some differences in the Former Yugoslavia). The overall water sector development and pricing approach focused on delivery of affordable service for all, at the expense of economic efficiency, quality, and sustainability of service provision, and lack of demand management combined with inefficient use of resources. Post-socialist period (1990 until EU integration). After the collapse of the socialist system, countries of the region explored different public service delivery frameworks. In most countries, a strong decentralization took place, sometimes coupled with more significant involvement of the private sector (in the Czech Republic and Hungary, for example). The disappearance of state funding and the need for modernization of infrastructure led to increased attention to economic efficiency and consumer-based financing. International financial institutions (IFIs) played an important role in the transition. EU integration (from the beginning of EU integration to today). The EU accession process and the transposition of EU legislation into national laws led to the introduction of the full cost recovery principle, a drive toward structural changes in the service provision sector, and, in the long run, increased efficiency and sustainability of service provision. EU regional policy, with its objective to narrow the development disparities among member states, meant EU funding became an important source of sector investment, in particular through Cohesion Funds financing environmental and transport infrastructure projects. 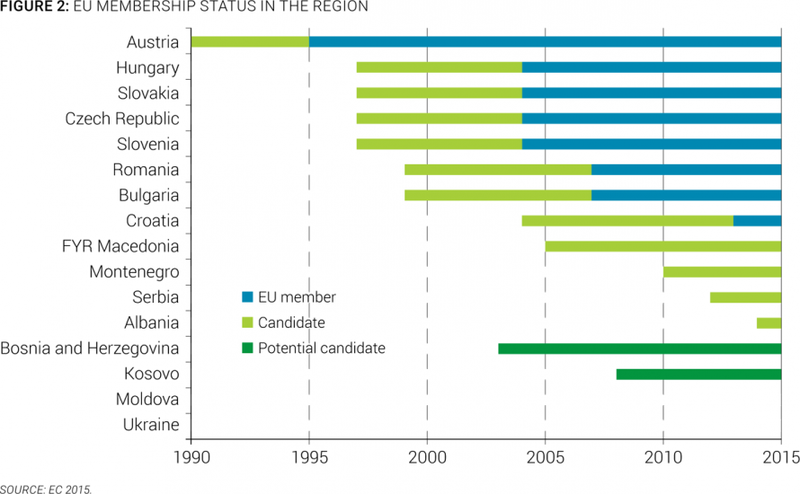 Of 16 countries in the region, 8 are currently EU Member States (Austria, Bulgaria, Croatia, the Czech Republic, Hungary, Romania, Slovakia, and Slovenia), and 4 (Albania, FYR Macedonia, Montenegro, and Serbia) have formal EU candidate status and are at different levels of the accession process. Two countries (Bosnia and Herzegovina and Kosovo) have expressed their desire to eventually join the EU and received a potential candidate status; they are at the preliminary stages of aligning their governance setup with the EU acquis, but they do not have formal candidacy status. Two countries (Moldova and Ukraine) have not yet formally defined EU accession as their objective; however, both governments signed in 2014 an association agreement with the EU and have expressed their commitment to EU integration. Therefore, the whole region is in various stages of EU integration, making it an overarching and mutually connecting regional process that will continue to dominate development in the region for the foreseeable future (Figure 2).